When I travel I always wear a sport coat as it is a good place to put my wallet, keys, passport, sunglasses and mobile phone. However when I am not traveling and the weather outside is akin to a steam bath, like most people I don’t wear a coat. I can handle having my keys, phone and even sunglasses but am aggravated by the fact that my big fat wallet does not fit well in any pocket. This is not due to a wad of cash or even a multitude of credit cards. I do have credit cards for my businesses and personal but I also have a bunch of other non-credit cards that I carry around for different purposes. For instance a Stop & Shop card is worth carrying now since you get specials by scanning your card when in the store, and at present Shell Oil is running a promotion whereby you insert your Stop & Stop card at the gas station and then receive $.20 off per gallon of gas. I also have my driver’s license, a Priority Pass airline club card, a Marriott club card, and yes even a library card, (although I rarely go to the library it seems yet is seems the one time I don’t have that library card is when I am actually trying to take out a book). Add a few business cards from the various entities I am a part of and I end up with my big fat (not Greek) wallet. Since I am not the type to go for the man-purse (not that I have anything against any man that sports one), I have upon occasion taken to pulling out my license and a credit card and leaving my wallet at home during warm weather months. But that is not always a practical solution. The concept of a digital wallet is nothing new. It’s been around for a number of years now. Sites like Pay Pal http://www.paypal.com would love to have all your transactions conducted via their platform. So would the mobile phone companies for that matter. Bank accounts are linked as are credit cards, driver’s license health card, loyalty card(s), and other ID documents stored on the phone. The Japanese have been using digital wallets for a number of years already. Digital wallets use something called Electronic Commerce Modeling Language to maintain data security and remove the need to enter customer information each and every time. Google introduced its digital wallet concept last month http://bit.ly/iG2ksG and Microsoft has been developing software for digital wallets for several years. I am ready right now to shift over to a digital wallet. The thing is even when I have one I still will have to carry around some information like a driver’s license (figuring the policeman will not be impressed by my digital license in every location) or credit card (what if my phone dies or runs out of juice?). While thin is in when it comes to analog wallets, I look forward to the day they go the way of LP’s. 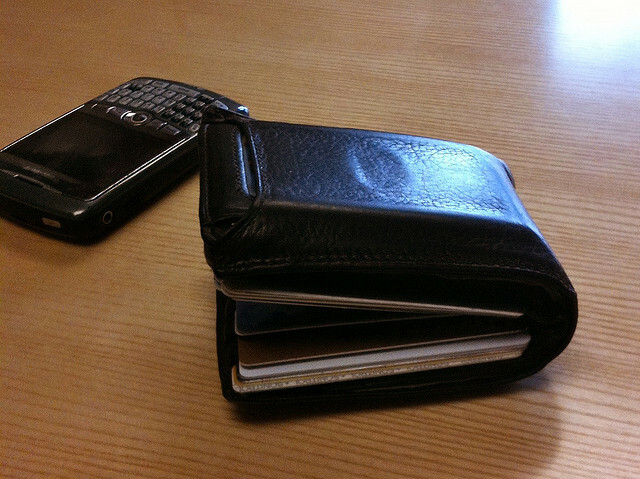 How about you – will you discard the leather wallet for a digital one? This entry was posted in Customer Experiences, Technology and tagged digital loyalty cards, digital wallet, Electronic Commerce Modeling Language, Google digital wallet, Marriott, Microsoft digital wallet, Pay Pal, Prority pass, Shell Oil promotion, Stop & Shop store card. Bookmark the permalink.